One of the great things about working with Higher Logic clients is learning from their expertise. With that in mind, this post will be the first of a series of posts highlighting top community manager practices. Recently, Shannon Johnson, Membership Marketing Manager at the American Association of Nurse Assessment Coordination (AANAC) shared on HUG a great way they combined marketing their private community with extending the value of their webinars. With her permission, I'm sharing some insights on what they did and how they did it. 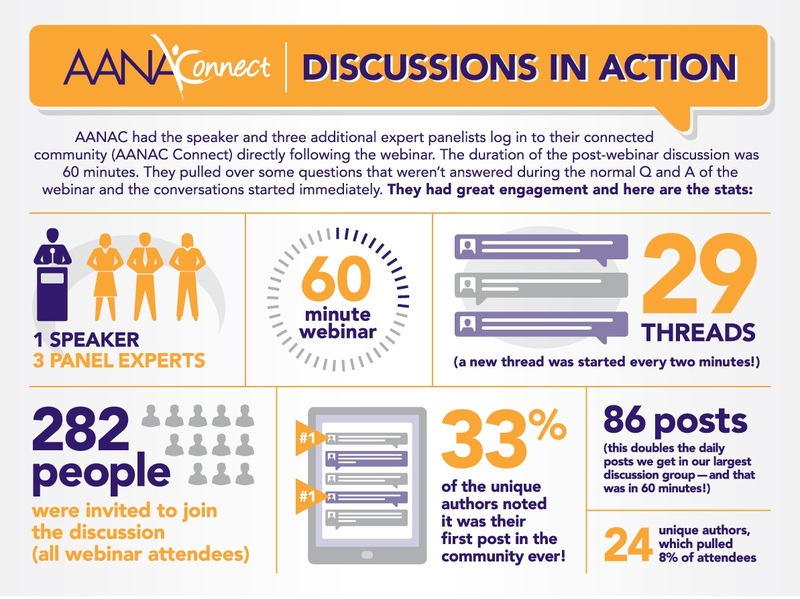 ANNAC has a thriving online community and also offers webinars as one of their educational offerings. What better way to boost both at the same time than adding a post-webinar discussion in the community? The purpose of the discussion was to drive new traffic and engagement to the community site, as well as expand learning into the community. They had the speaker and three additional expert panelists log in to their community directly following the webinar. The duration of the post-webinar discussion was 60 minutes. They pulled over some questions that weren't answered during the Q&A portion of the webinar, which provided the backbone of the discussion and proved to be great fodder for engagement. Included a line about it in the webinar confirmation with a link to "Click here the day of the webinar to access the community." Sent out an email the morning of the webinar with the link again and asked attendees to post questions in the community in advance of the live event so the conversations could begin immediately. The webinar host posted the first message about an hour before the webinar saying she was excited to see everyone there in a little while. Gave attendees clear simple instructions on how to view and post messages. The following day, the digest went out to all webinar attendees, whether they participated in the post-event discussion or not, so all got to see the follow up discussion with each question answered. As for how they structured the discussion within their community, they did not host it in their general discussion group; rather, they set it up as an event community which was automatically populated with attendees that registered once the sale was complete within their AMS/CRM. That way only registered attendees had access to the bonus "free consulting," a huge value-add for the cost of just the webinar. Another benefit of hosting the event outside of the general discussion group was being able to design a custom, event specific community landing page. Instead of having tabs for the usual "members" and "shared files" etc., they changed them to be more event specific such as "Attendees" and "Handouts". For 33% of the unique authors, it was their first post in the community ever! Big thanks to Shannon for sharing the success of this event. Have your own private community platform success story to share? Please leave a comment or contact me and your community could be featured in a future post.